Especially eyewitness reports can clarify by the reconstruction of specific events. My uncle Gerrit Keet (1922) lived during the war in Amsterdam. He was present by the shooting at the Dam. On May 7 a lot of people were present at the Dam, to celebrate and listen to the speeches. A big crowd had gathered and I stood in the centre of the Dam. There were still no Canadians or Yankees in town and the German troops were not disarmed. As I remember, a truck with German soldiers drove that afternoon along the Royal Palace, and I was told that some people had been jeering at the Germans. Perhaps it was interpreted as a provoking. After a short while I heard shots. 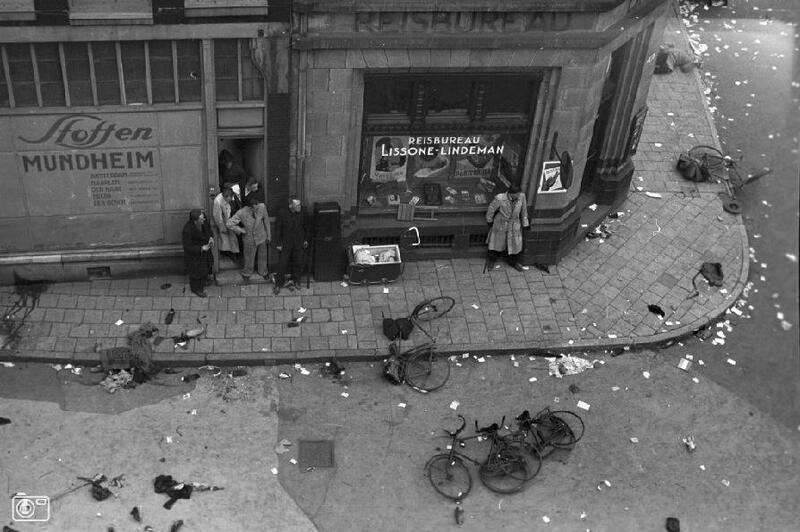 A German soldier with a machine-gun, started to shoot, from the roof of the Groote Club at the corner of the Kalverstraat, into the crowd. Panic broke out and the crowd fell apart. By the hearing of the shots I fell on my belly and crawled with countless of people, around me, to a porch on the corner of the Nieuwendijk, while the shooting still goes on. With a few people we sought for cover in the basement of the store. I can’t remember how long we have been there but we were frighten because it looks if there came no end to the shooting. When it was quiet, we went outside and saw the Domestic Armed Forces with stenguns in their hands, apparently to set things right. The sight of the Dam was terrible. The square was a complete chaos. Shoes, clothing and other things laid widely spread and also the barrel organ was ruined. That afternoon 20 dead and 100 wounded persons fell. The barbarians had struck for the last time. I felt a great anger inside of me and at that moment I was capable to attack the Germans. The incident was a great shock among the population. And all the times I will cry.